Summary questions are automatic groupings of questions of the same type from the same page and of matrix questions. 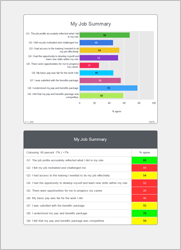 Summaries are an effective way to quickly get an overview of a survey covering one or more topics. Works well for presentations. Word outputs are formatted as a chart and table per page. Excel outputs have a tab for each topic or page. Web reports are continuous. The PowerPoint format uses alternating chart and table slides for each question.